The Magnify² system is specifically designed for creating gigapixel resolution imagery of macroscopic and microscopic subjects. The complete turn-key system provides the robotics, optics, camera, software, and computing power to create GIGAmacro images with ease. It combines the latest imaging advancements, software, hardware, and online gigapixel viewing into one system at an affordable price. See normally invisible details: unprecedented image quality and resolution, to micron scale. Gather input with powerful annotation, comparison and analysis tools. 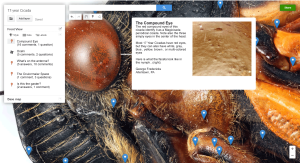 View and share your specimens and collections online with colleagues, teams & clients world-wide with GIGAmacro Viewer. Complete solution including robotic automation, image capture, post-processing, and online viewing, sharing, and annotation. After subject setup, Magnify2 runs unattended, freeing you for other tasks. Saves money and reduces operational costs by automation and use of off-the-shelf cameras and lenses. Our emphasis on build quality, training and support ensure high throughput and continuous operation for scanning large collections. Templates available (custom ones too!) 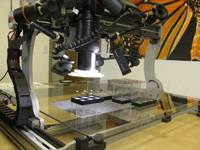 for drawer scanning – large collections can be scanned without disturbing specimens. Turn-key solution, complete and ready to go – with training and support to match your needs. Specimens are not affected in any way by being imaged, preserving the integrity of the original item. Designed to fit on a standard trolley and will roll through a standard sized door. Compact – folds flat for transport and shipping, improving portability and reducing shipping costs. 6 months parts and labor warranty and 1 year technical support give peace of mind (Third party items included in system carry their standard vendor warranty). Our emphasis on build quality, training and support ensure high throughput and continuous operation for scanning large collections. Everything you need to capture, store, share and annotate detailed, sharp images. Use our Template system to go from individual specimen capture to high volume, multi-specimen, automated capture. Saves money and reduces operational costs by automation and use of off-the-shelf cameras and lenses. Zoom into and move around a hugely detailed, completely in focus, image. See normally invisible details: unprecedented image quality and resolution, to micron scale. Examples in our gallery. On Mobile Devices, Web Browser or Desktop. The GIGAmacro Viewer lets you zoom to see incredible, sharp detail; scroll around the complete image, mark up and share information or insights on detailed images via your mobile device or a web browser. Capture and export 3D data from small low-relief objects, using our GIGAmacro magnify2 system to capture the photos and off the shelf software to process and convert the data into a 3D object. Complete solution including robotic automation, image capture, post-processing, and online viewing, sharing, and annotation. Let the system do the work for you with automated robotic controls. Set up your subject or specimen and leave the Magnify2 to finish the task. 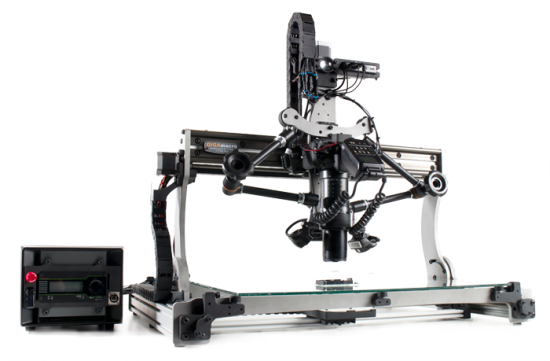 Magnify2 System is a complete, high performance, precision robotic 3-axis linear motion control, image capture, post-processing, and online viewing & annotation system. Lightweight anodized aluminum construction throughout. Self-contained control panel and enclosure with integrated camera power, and control systems. A turn-key solution ready to go, out of the box! All software configured and installed for ready to run operation. GIGAmacro Magnify2 Motion Control System & Capture Software. Zerene Stacker, and Autopano Giga software included. The GIGAmacro Viewer is available for mobile / desktop devices (with annotation, comparison, sharing and measurement tools). Canon T3i, 18MP. Canon MPE-65mm Macro lens with telecentric lens adapter. (substitute Sigma 105 Macro with telecentric lens adapter at no cost). Canon Macro Twin Lite Flash with external power. Positioning with Dual Manfrotto Magic Arms. Custom GIGAmacro Evenlight Diffuser. Imaging Area: 635mm (X) x 534mm (Y) x 254mm (Z). 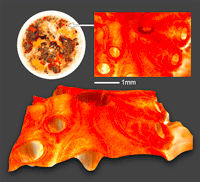 Imaging Resolution: Resolvable detail as high as 1 micron. Imaging Stage Dimensions: 825mm x 750mm (6.5mm Safety Glass). Positioning Accuracy: 16 micron (X, Y); 3 micron Z. Positioning Speed: 76 mm/sec (X, Y); 12 mm/sec (Z) axis. Bearings, Rails, Lead System: High performance precision IGUS Drylin anodized aluminum rails, bearings, lead screws and nuts (no lubrication needed). Shipping Dimensions (crated): Inside: 107cm W x 94cm L x 36cm H. Outside: 110cm W x 97 cm L x 39cm H. (2.46m LWH). Control Enclosure Dimensions: 25cm W x 22cm H x 42cm L. 5.5Kg. Power requirements: 650 W; 110V or 220V compatible. Additional power needed for imaging computer. Canon MPE-65mm Macro lens with GIGAmacro telecentric lens adapter. Sigma 105 Macro with GIGAmacro telecentric lens adapter. Infrared Camera and Lighting (modified camera for IR and flash filter). Ultraviolet Camera and Lighting (modified camera for UV and flash filter). Surface etched, and anodized table. Key inserts: 18-8SS Key-Locking thick wall inserts, 8-32 interior thread, 5/16″- 18 exterior thread, 5/16″ length. Software and physical templates for museum drawer imaging. Please contact us for quote.